Sarah Ann is all about surprises lately! She loves to take paper or poms, or really anything she can find, and throw it up in the air and say “Surprise, Mommy!” This is usually followed by a hug and a “Happy burfday!” That then leads to her getting out her wooden birthday cake set, so that we can all have cake! 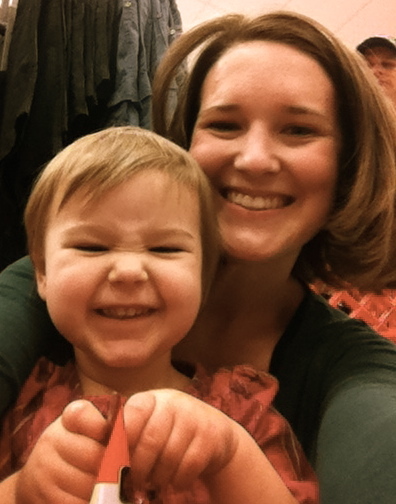 She has such a vivid “imanation” (imagination, and she always points to her head when she says it!). Then she will show me whatever she was hiding behind her back, a toy or book. Then she gives me a big hug, and we start all over again! 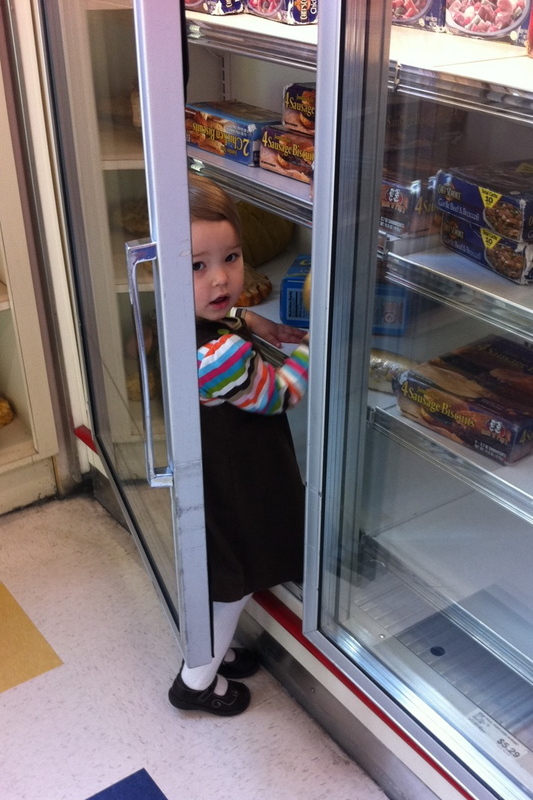 I sure do love this silly little girl and all of her surprises! 1. Sarah Ann has always been attached to her “loney” and “pac.” Reece will not take a pacifier, and he never found his thumb either. I give him his lovey when I put him down for his naps, but he doesn’t have to have it like his big sister does. 2. 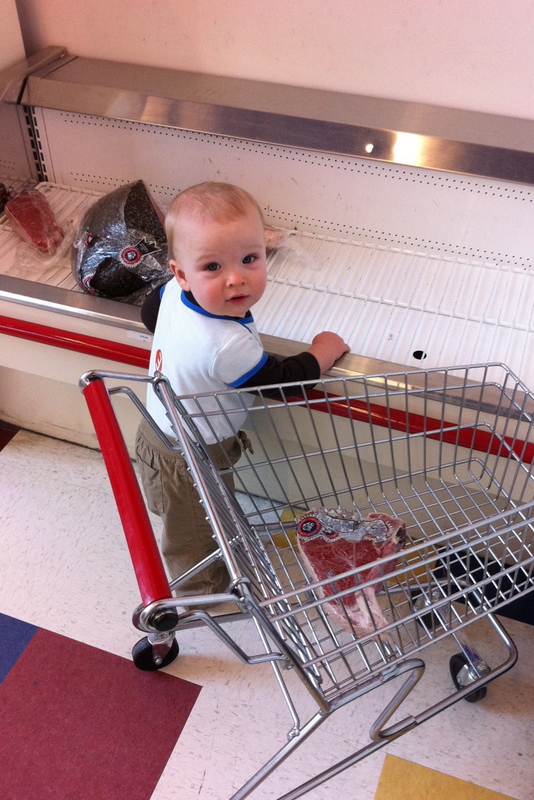 Reece, as of right now, really likes vegetables–potatoes, corn, and green beans are his favorite. Sarah Ann would much rather have fruit! 3. Sarah Ann started crawling around 9 months. Up until then she was just very content sitting somewhere and playing. 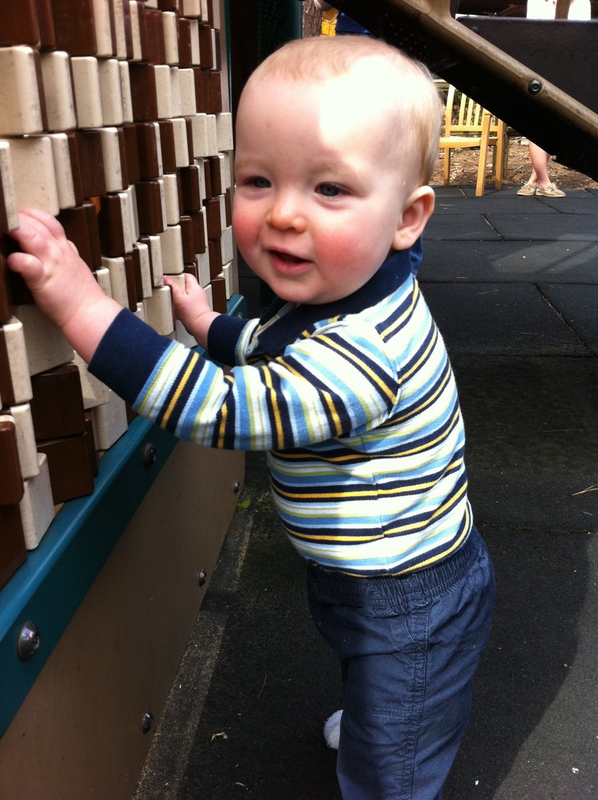 Reece started crawling around 7 months and is always on the go–crawling, cruising, and climbing! Sarah Ann didn’t crawl for long, and she began walking around 10 1/2 months. Right now Reece does not care at all about walking. He knows that he can get wherever he wants very quickly by crawling! 4. They are both big book lovers! It is about the only time I can get them both to sit still. They both definitely have their favorite books too, and I’m pretty positive I can recite “Goodnight Moon” and “Hand Hand Fingers Thumb” from memory. 5. Sarah Ann loves to steal the show. She is capable of playing independently and we are definitely working on it, but she much prefers to be playing with you and talking to you. Reece could play all day long by himself as long as I am sitting right there in the living room with him, but as soon as I get up to leave he is crawling up my leg for me to hold him! 6. They love bathtime, playing outside on their swingset, eating pizza and french fries, seeing the fish at the zoo, sitting by each other while they eat, laughing together, playing musical instruments, watching “Yo Gabba Gabba,” and more than anything else, they love each other! Thursday was a very good day! 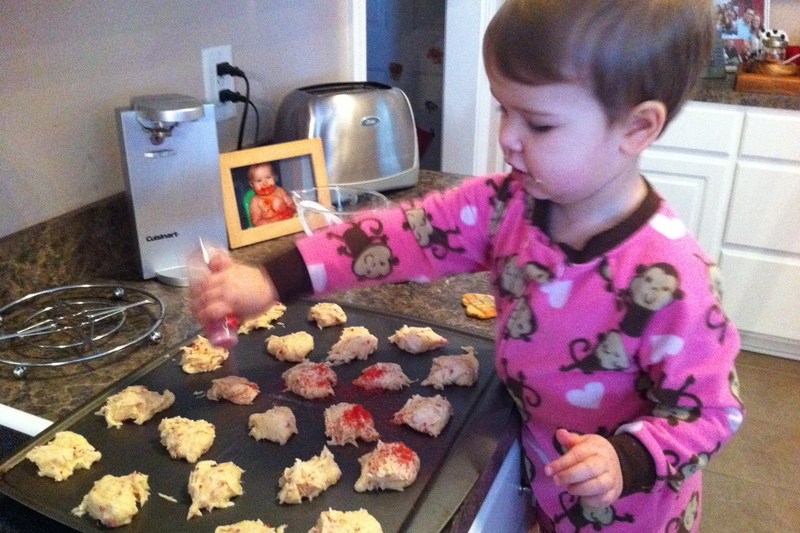 We played all morning, and Sarah Ann and I made cookies while Reece took his morning nap. We all three enjoyed an early lunch before heading downtown. We took the cookies to Daddy at work and then a quick trip to EdVenture before naptime! We practically had the “musum” to ourselves. 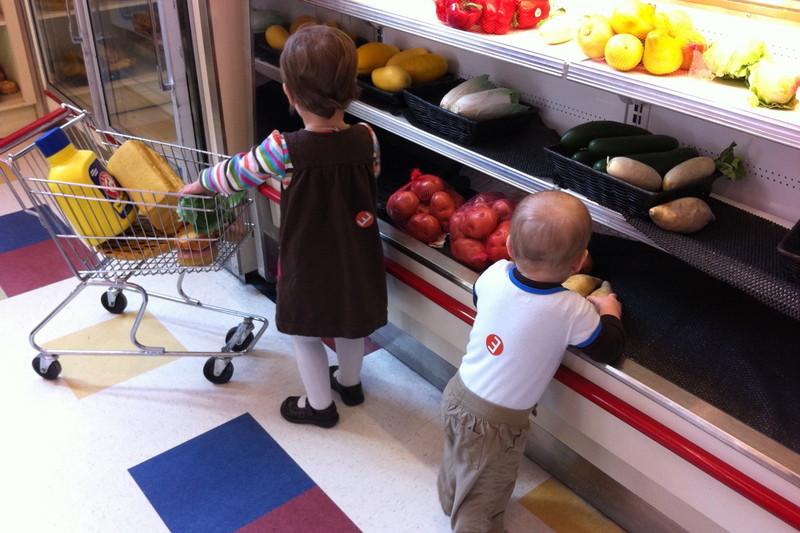 The grocery store is definitely the babies’ favorite part, and we were the only ones in there yesterday, so Sarah Ann and Reece had a great time roaming all over! After playing for a little while, we headed home for naps. Sarah Ann fell asleep on the way home, and Reece went right to sleep after he nursed. They both took great naps, and I got everything done that I needed to get done around the house! 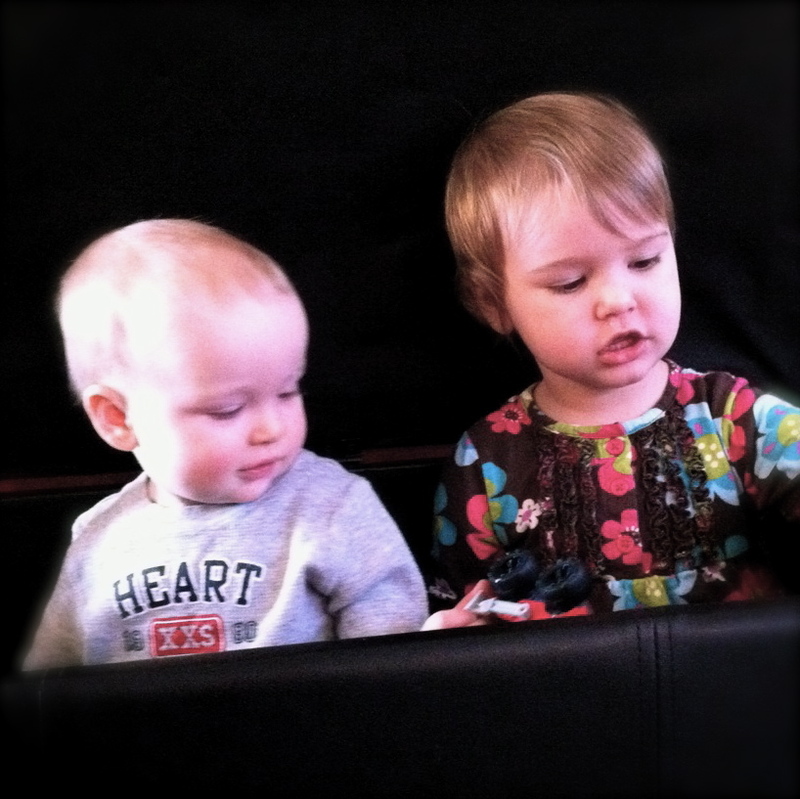 After naps, we had our snack, watched “Yo Gabba Gabba” and played the afternoon away! We had dinner with friends, and Sarah Ann got to stay up past her bedtime and go to a Thirty-One and jewelry party with me. Jeffrey and Reece got to enjoy some quality time together too before he went to bed! And after the babies were both in bed, I got to watch “Grey’s Anatomy” while Jeffrey worked on the computer beside me. Let’s just say that Friday was a completely different day! Jeffrey and I stayed up too late Thursday night, so I had a hard time waking up this morning. Sarah Ann also had a hard time waking up since she got to stay up past her bedtime. Sarah Ann and Nanny went to gymnastics while Reece took his nap and I did the laundry. After gymnastics, we headed to the mall for lunch and playing on the play area. SA had a breakdown on the way there because she wanted to ride in Nanny’s car, and then again once we got to the mall because I wouldn’t let her eat lunch at a kiddie table. The mall was crowded and hot. Once we survived lunch and another small meltdown because SA thought we weren’t going to play, we finally got to the play area and there was a few minutes of peace! Until…Sarah Ann couldn’t keep her hands off Reece and she pushed him into the bridge. I knew it was time to go, which led to another meltdon…both by SA and Reece. Reece was having way too much fun to leave! Sarah Ann fell asleep on the way home, and Reece went right to sleep when we got home too…finally a few moments of peace! I couldn’t even think about mopping or getting anything done, so I decided the best thing to do was take a nap myself! After naptime, the babies played while I got dinner ready. 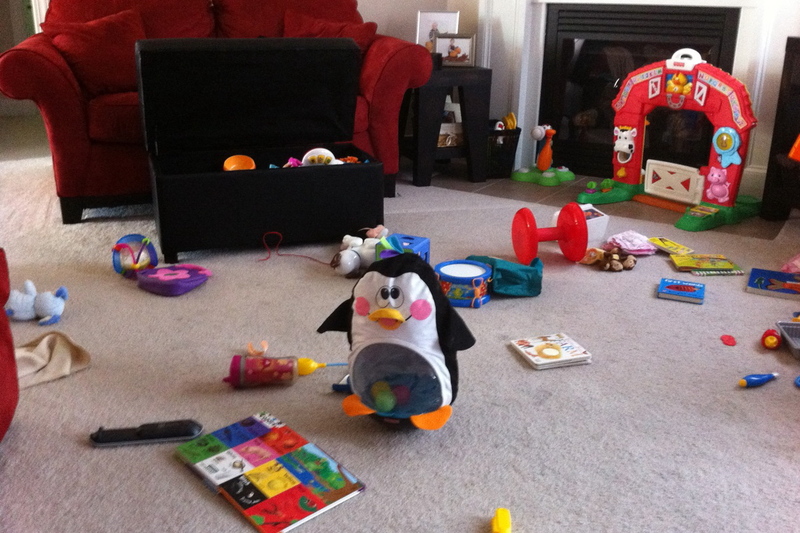 We cleaned up and headed outside until Daddy got home…surely this way be a great way to survive the rest of the day! Well, Sarah Ann spilled all of the bubbles in the garage and Reece kept trying to eat the sidewalk chalk and climb our brick stairs! I had never been so happy to see Jeffrey’s car pull up in the driveway at 6pm! We all enjoyed dinner, and the babies took their baths. Reece has become quite the little wild man in the bathtub! I was counting down the minutes until bedtime, and then finally got around to cleaning the kitchen (and Jeffrey helped too!). Yesterday was a pajama day at our house! This week it was Sarah Ann’s turn to have a double ear infection, so we have been spending our mornings relaxing at home and trying to get some fresh air in the afternoons! We had so much fun staying in our pajamas all morning, Mommy included! 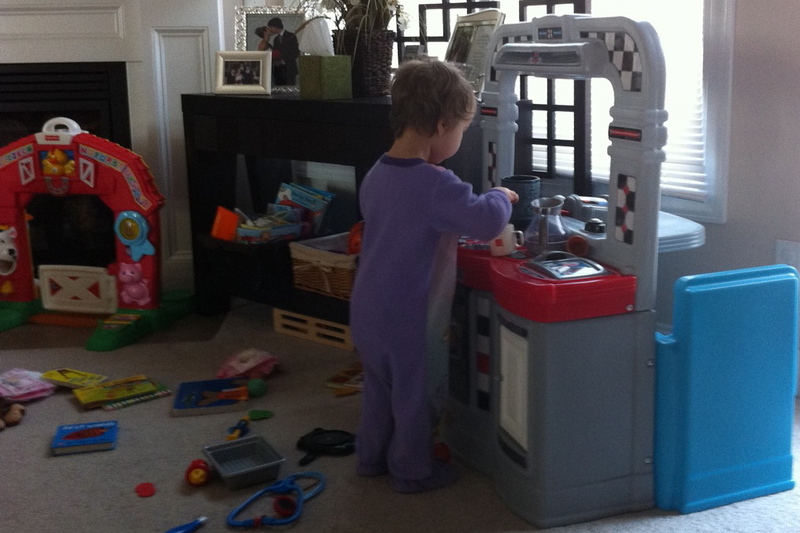 Reece pulled all of the toys out of toy box, and Sarah Ann spent lots of time in her “titchen” cooking! The living room was covered with toys, and when they were done in the living room they followed me into the kitchen and had fun with the ABC magnets! After a yummy lunch, Sarah Ann was a great helper getting everything cleaned up, especially when we sing the clean up song! We had a great morning cuddling, playing, laughing, singing, dancing, and relaxing! I am grateful for all of these special moments with my two sweet blessings! And Reecey, I might not always tell you to listen to your sister, but in this case, please do! You are growing up too fast! You now have 4 teeth, and 2 more on the way! 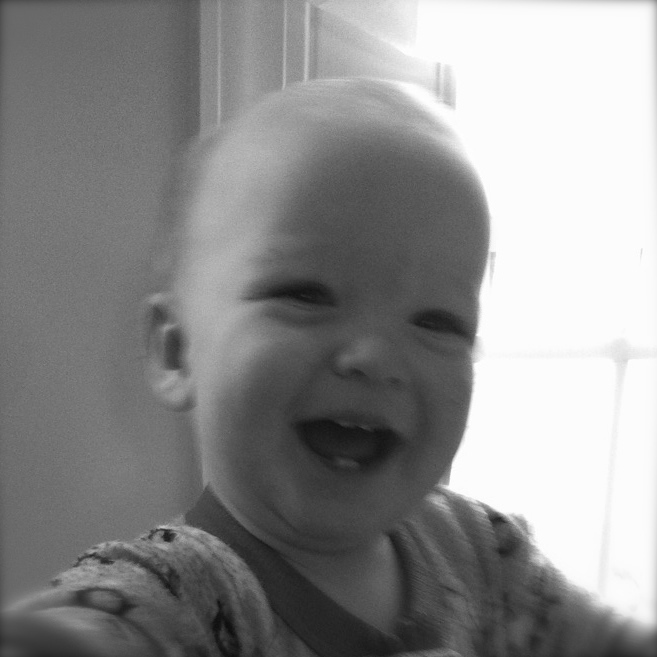 Now I must say that I love that little toothy grin! But, that still doesn’t mean you have to grow up sweet boy! Can you please just stay my baby forever? Today I would like for you to meet our Compassion children. 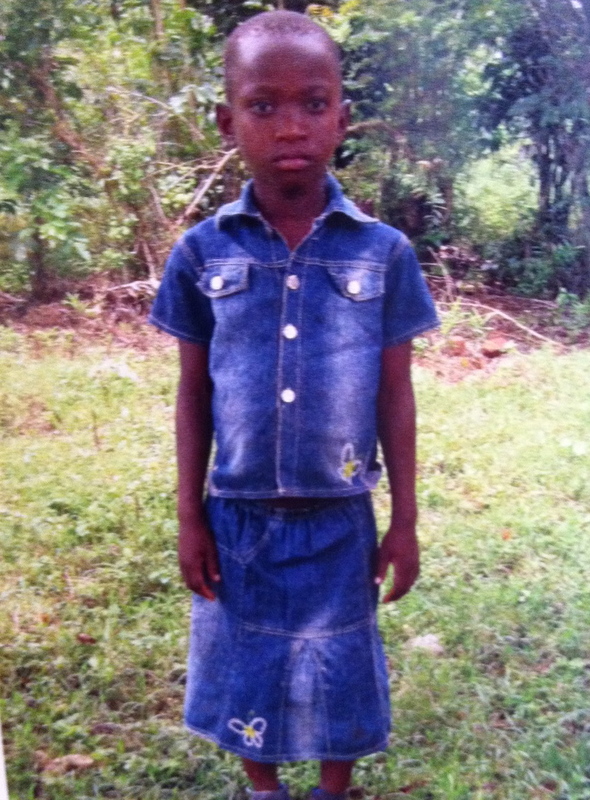 We have the great privilege of sponsoring two children in Africa each month through Compassion International. This sponsorship pays for their school fees, medical care, and meals for Samuel and Dolotia. Being a part of the Compassion program also involves them coming to Sunday School and weekly Bible programs. 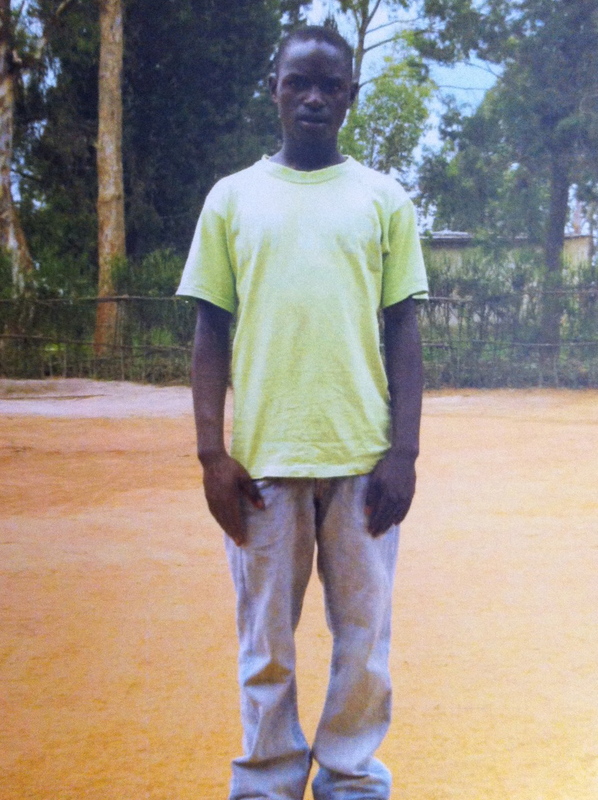 I began sponsoring Samuel the summer after my freshman year in college, 8 years ago. He lives in Rwanda and is now 18 years old. He works hard in school and loves to share his favorite Bible verses with us when he sends us letters. He helps his family by growing beans. Jeffrey and I added another child to our sponsorship in the summer of 2006 when we got married. Midah lives in Uganda, a country very close to our hearts. Her mother died last fall, and she now lives with her dad and step-mom. She had to move away from the Compassion project, so we are no long able to sponsor her, but her picture will forever remain on our fridge and her life will forever be in our prayers. 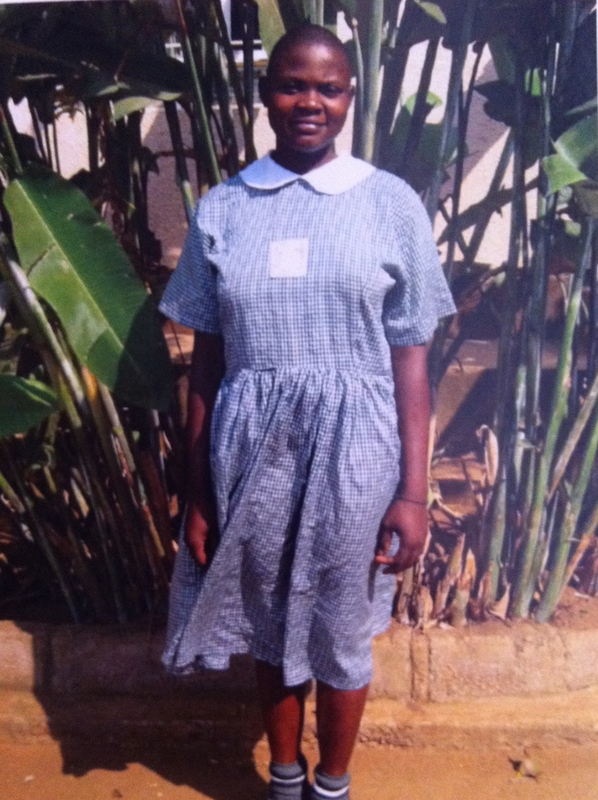 When our sponsorship with Midah ended, we began sponsoring Dolotia. She also lives in Uganda and has 4 other siblings. She is 8 years old. We recently received our first letter from her, and Sarah Ann loves the picture that she drew. I am looking forward to Sarah Ann and Dolotia being pen pals! I hope and pray that you might be willing to sponsor a child through Compassion International too! You can check out their website here to learn more. Brandi and I have been friends since high school–we went to church together, cheered together, carpooled to tumbling, and even went on a mission trip to Argentina together! And now several years later, we have had our babies together too! Brandi’s little girl, Lynsie, is 5 weeks older than Sarah Ann and her new little man, Kyle, was born in September, so he is just a few months younger than Reece! 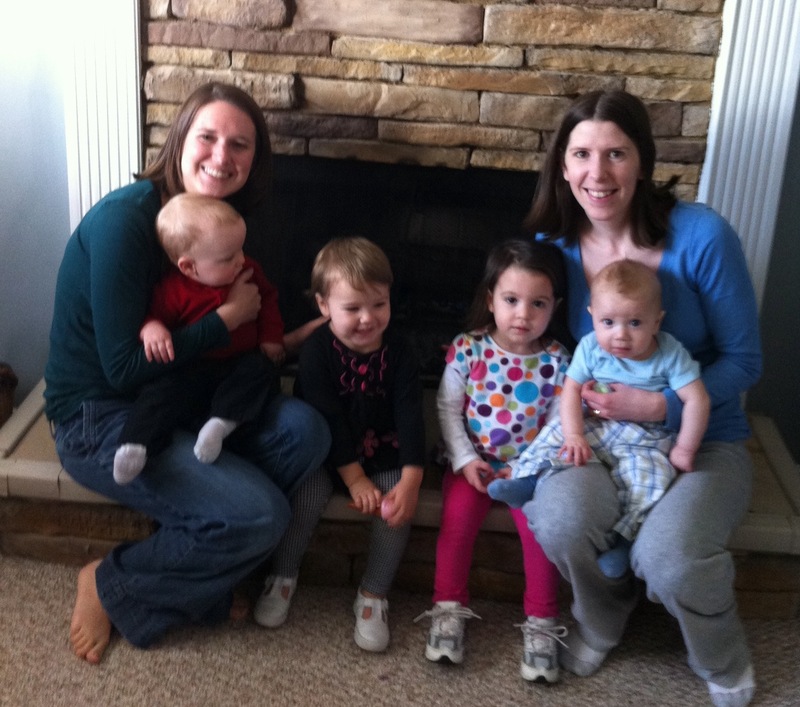 We got to meet Kyle for the first time this past weekend, and Sarah Ann loved playing with Lynsie again! If you know anything about Reece, you know that he is very attached to his Mommy, but when he woke up from his nap he went right to Brandi–maybe he thinks we look alike! Here is a picture of all six of us on Saturday: The 2 Mommies, the 2 brown eyed big sisters, and the 2 blue eyed baby brothers! Thank you for having us over to play, Brandi! We can’t wait to see you all again hopefully very soon! We spent lots of time play outside this week. It has been so wonderful to get fresh air and enjoy the warm and sunny weather! I know that I have mentioned before how much we love the zoo, and we love it so much that we actually made three trips this past week! It is so great to be able to go just for an hour or two, visit the animals, let SA run around, and Reece loves to be strolled around! As much as we love the zoo, we also love playgrounds! However, I don’t usually let SA see the playground at the zoo because I know that she will want to stay there the whole time. 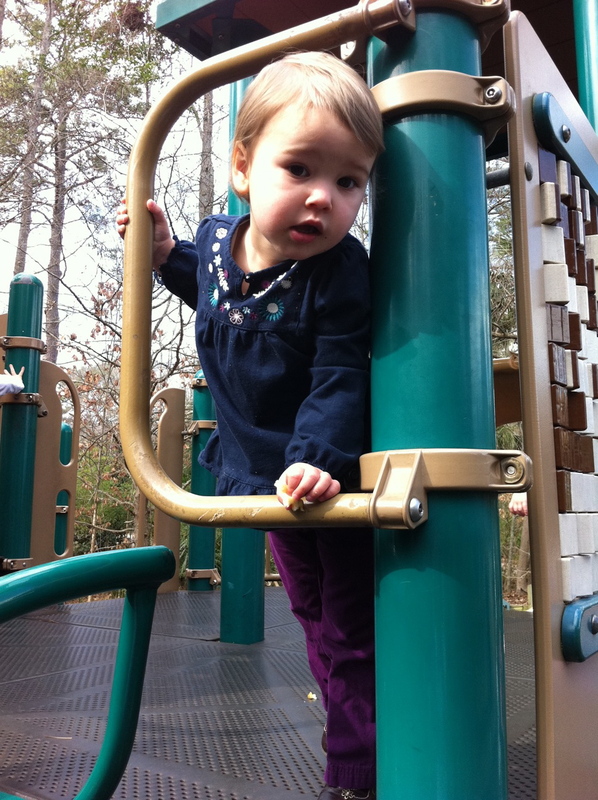 Unless Daddy is with us, I usually try to divert her attention away from the playground, carousel, and lorakeets! Those have become special treats when we go with Daddy! But, last Friday we got to the zoo a few minutes before meeting some friends for lunch, so I thought I would give SA and Reece a chance to move around a little bit before getting back in the stroller to go around the zoo. SA was so excited! She kept saying “payground, at the zoo, payground at the zoo! this is super duper duper!” Reece also thought he was quite the big boy cruising around! Many days I feel like the babies teach me much more than I am teaching them. I love that they love all the little things throughout the day. They remind me to find joy in the simple pleasures, like a few minutes on the playground! 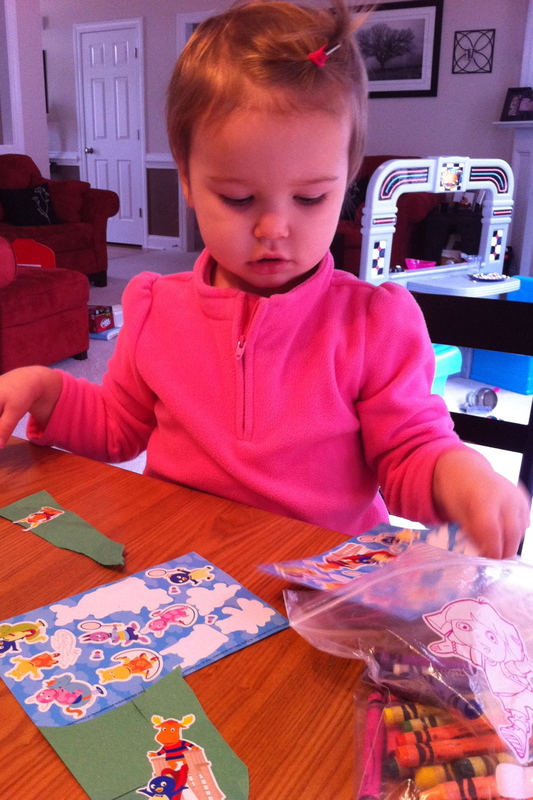 Once upon a time there was a pretty little princess who loved to do crafts with her Mommy. Mommy would plan out crafts each month and even though it seemed like the little princess completed the crafts in about 2.7 seconds, they had a lot of fun together! Then along came to adorably cute and sweet baby prince, and Mommy wasn’t so great about doing crafts anymore. The little prince loves Mommy very much and doesn’t like to be far from her very often, so it made craft time a little more difficult. Once the princess started school she got to do all kinds of crafts that now decorate all of our kitchen cabinets, and the princess is quite proud of her work! 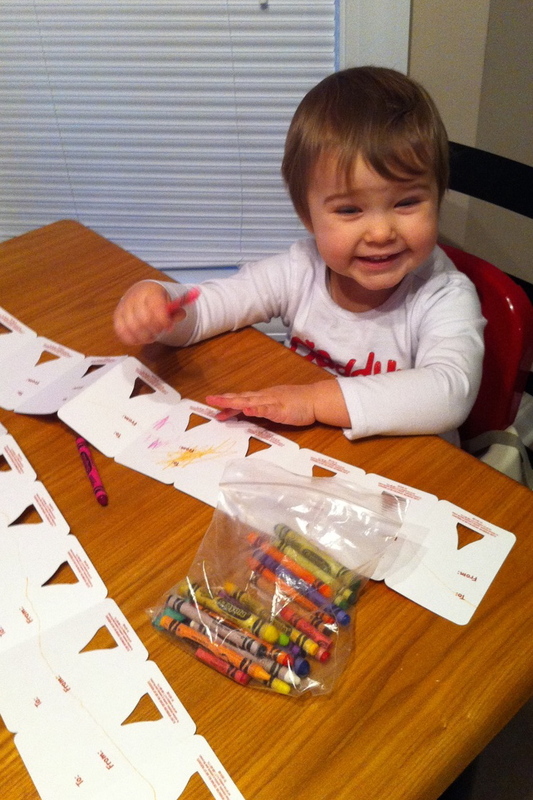 She loves to show her Daddy all of the art projects on display in the kitchen! While Mommy loved that the princess was doing crafts at school, she really wanted to make an effort to have some special time doing crafts with the princess at home too. The baby prince takes a little nap in the mornings, so Mommy thought that would be the perfect time to spend doing crafts and other activities with the princess. It would be very easy for Mommy to want to use that time to be productive, because the princess could play on her own, but right now, it doesn’t matter if Mommy has the cleanest house or if all the laundry gets done. What matters is that the princess gets some quality time with her Mommy while the little prince cuddles up with his pillow pet! Some days we do crafts, some days we make cookies, or cuddle up on the couch and watch Dora, but no matter what we are doing the princess and Mommy are very happy to spend quality time together! And not to mention it does wonders for 2 year old behavior! 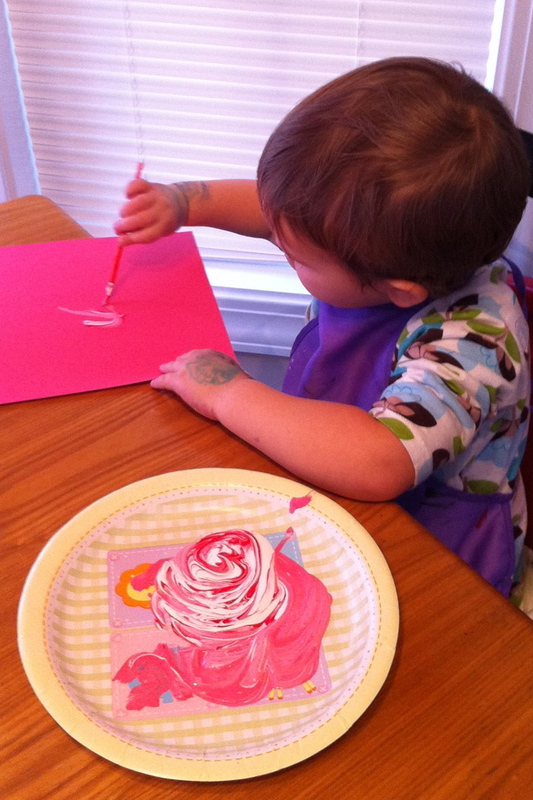 mixing red and white paint to make pink! the princess does a great job using her scissors! 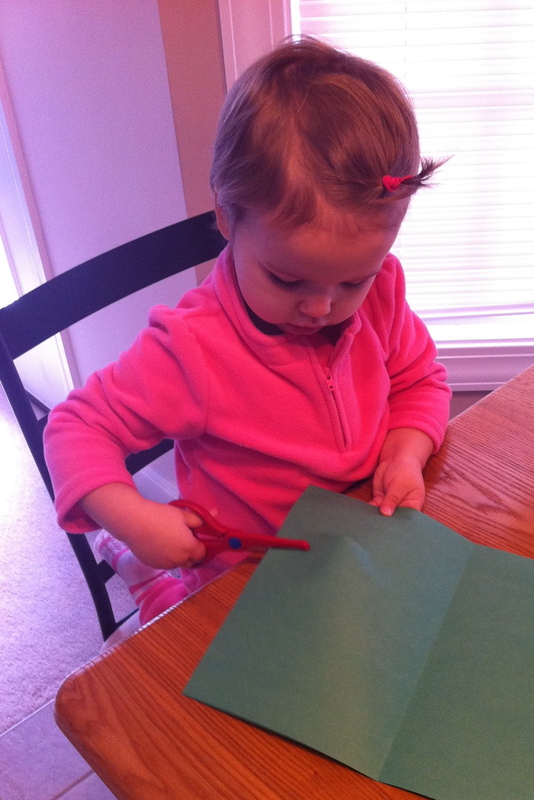 making a card for daddy! getting the cookie dough ready! 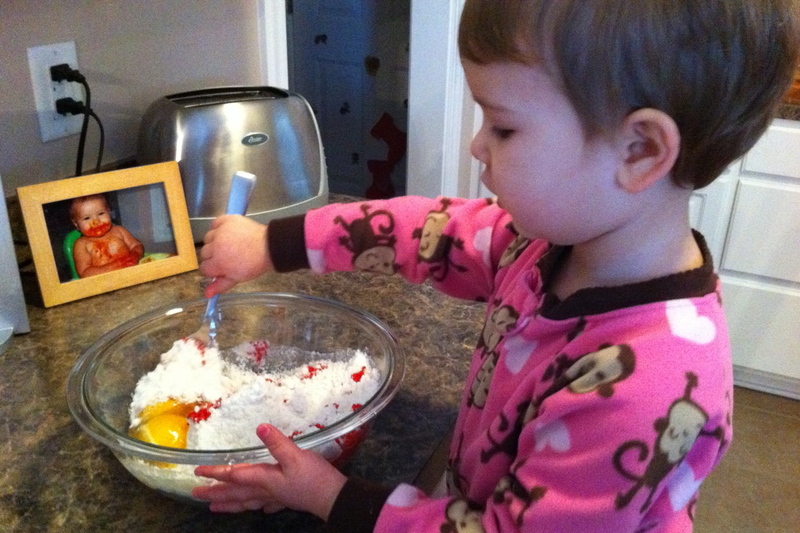 adding the sprinkles for "my frends"
And we all live happily ever after! The End! 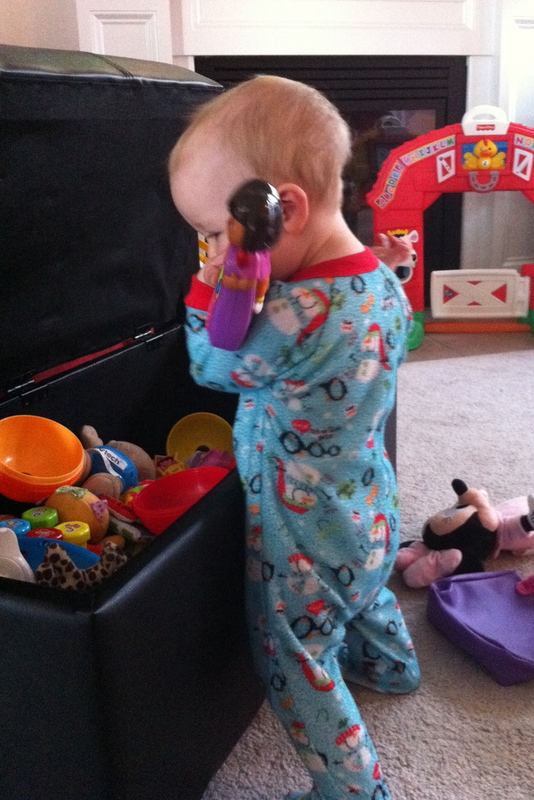 Since November, Sarah Ann and Reece have together had 8 ear infections, six of those being double ear infections. We have had numerous colds, taken several antibiotics, spent lots of days inside at home, and taken motrin and tylenol to help the fevers and pain. Many days this winter have been very trying and very hard. I think to myself, what I am not doing to keep them healthy? 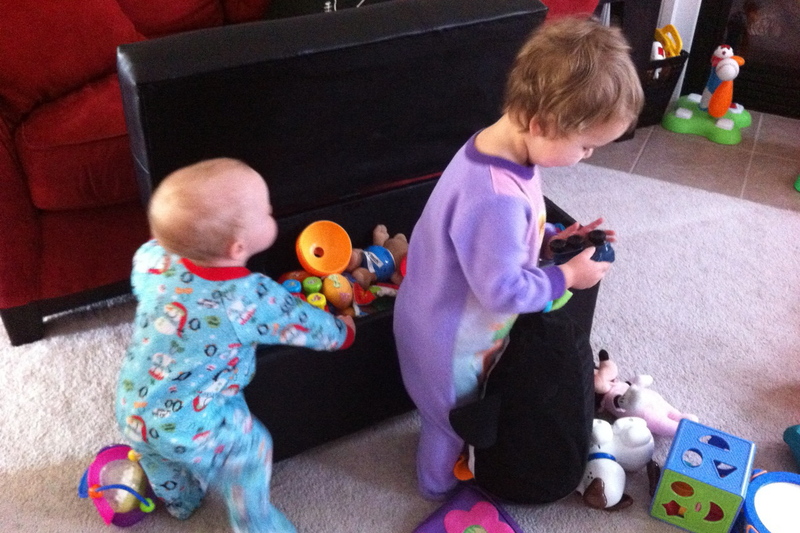 We keep the house clean and disinfected, we wash our hands, and we are really working on not touching everything…which is extremely hard for a two year old and a 10 and 1/2 month old. I want to get frustrated because we can’t seem to all be well for more than 2 weeks at a time, and it can be very easy to get upset and mad when I’m running on little sleep and exhausted from trying to keep the babies happy all day long when they don’t feel good. But instead of letting my emotions get the best of me, and instead of asking why, I am choosing to be grateful. I’m grateful for antibiotics and for health insurance. I’m grateful to be home with the babies to take care of them and take them to the doctor. I’m grateful for the warm sunshine and fresh air that will help us get rid of some of these germs. I’m grateful for the snuggles and cuddles, and the snotty kisses. I am grateful to know the God who heals, and is full of grace and love. And today I’m also grateful that it is only a double ear infection. It’s flu and RSV season, so their illnesses could be much worse. We’ve never had to make a trip to the ER, or stay overnight at the hospital and watch our babies lay in a hospital bed. I know that there are many families in our area and all over the country who are really hurting right now as they wait to hear if their babies are going to be okay. There are babies all over the world who don’t have clean water or medicine to help them when they are sick. So, as I pray for Reece to be healed quickly, I will also pray for other babies who are far more sick and for their families that are hurting, and I pray that God will bring healing and peace and comfort. I will pray that my gratitude and faith will never waiver no matter what the illness might be, and I pray that I will always choose to be grateful and trust that God is working and moving, and He is sovereign above all! I’m grateful for these sweet babies and for this double ear infection that God could use to teach me so much!